WWT in collaboration with DesignerApparel.com, a new shopping search engine that carries tons of brands from juicy couture, to versace, to dkny, are giving away this bop bijoux open pyramid ring to one of you lucky readers. so leave me a comment by june 30.. along with an email address so i can contact you. easy peasy. And that ring is seriously, seriously awesome. Thank you for hosting this! you look lovely in that outfit, the skirt is so nice- and also those are some real pretty shoesies! went to your shop-and saw that those were shorts- even cooler! ps. how do u manage to wear peeptoe shoes without getting intense feet pain? do u ever slide forward in you shoes? Love the ring, great giveaway! I LOVE big funky rings, and Bop Bijoux things are all so cute! Thanks for the great giveaway. Hi, You look Fabulous as usual ! By the way, I finally ordered my first pair of Louboutins ! Thanks for the advice on the CL s.
Hey I'm having a similar giveaway too from those fab folks but for a bracelet. Of course I can't enter mine OWN but you can! And I can enter this one :) lOVE the ring! Thanks for hosting this.. your blog is pretty cool! 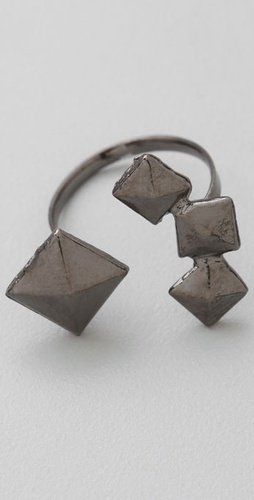 i waaantt this ring! Hopefully it'll be mine hahah.. Thanks for the giveaway!!! Love your style! My email: mapetitechou88(at)gmail.com. Hope I win!! i want! cool site. anhesty at gmail dot com. i love floral skirts! but i feel like the length is usually too short so my pear-shaped body is NOT happy.. hahaha. xkhaotik @ gmail . com ! Love those black and white wedges! Cute blog! I hope I win the ring, it would be a great Graduation present for me! Love the black and white wedges! love your guys' shop! and thanks for this giveaway! cute rings (: a must in my collection! You have a knack for picking out the most flattering outfits.